If you’ve been paying much attention to the climate policy discussion over the last few years, you’ve probably heard mention of carbon budgets, or greenhouse gas (GHG) emissions budgets more generally. Put simply, for any given temperature target there’s a corresponding total cumulative amount of greenhouse gasses that can be released, while still having a decent chance of meeting the target. For example, the IPCC estimates that if we want a 2/3 chance of keeping warming to less than 2°C, then we can release no more than 1000Gt of CO2 between 2011 and the end of the 21st century. The IPCC estimates that if we want a 2/3 chance of limiting warming to less than 2°C, then we can release no more than 1000Gt of CO2 equivalent between 2011 and the end of the 21st century. The reason the IPCC and many other scientist types use carbon budgets instead of emissions rates to describe our situation is that the atmosphere’s long-term response to GHGs is almost entirely determined by our total cumulative emissions. In fact, as the figure below from the IPCC AR5 Summary for Policymakers shows, our current understanding suggests a close to linear relationship between CO2 released, and ultimate warming… barring any wild feedbacks (which become more likely and frightening at high levels of atmospheric CO2) like climate change induced fires vaporizing our boreal and tropical forests. Figure SPM.5(b), from the IPCC AR5 Summary for Policymakers. What matters from the climate’s point of view isn’t when we release the GHGs or how quickly we release them, it’s the total amount we release — at least if we’re talking about normal human planning timescales of less than a couple of centuries. This is because the rate at which we’re putting these gasses into the atmosphere is much, much faster than they can be removed by natural processes — CO2 stays in the atmosphere for a long time, more than a century on average. We’re throwing it up much faster than nature can draw it down. This is why the concentration of atmospheric CO2 has been marching ever upward for the last couple of hundred years, finally surpassing 400ppm this year. So regardless of whether we use the entire 1000Gt budget in 20 years or 200, the ultimate results in terms of warming will be similar — they’ll just take less or more time to manifest themselves. Unfortunately, most actual climate policy doesn’t reflect this reality. Instead, we tend to make long term aspirational commitments to large emissions reductions, with much less specificity about what happens in the short to medium term. (E.g. Boulder, CO: 80% by 2030, Fort Collins, CO: 80% by 2030, the European Union: 40% by 2030). When we acknowledge that it’s the total cumulative emissions over the next couple of centuries that determines our ultimate climate outcome, what we do in the short to medium term — a period of very, very high emissions — becomes critical. These are big years, and they’re racing by. Is 1000Gt a Lot, or a Little? Few normal people have a good sense of the scale of our energy systems. One thousand gigatons. A thousand billion tons. A trillion tons. Those are all the same amount. They all sound big. But our civilization is also big, and comparing one gigantic number to another doesn’t give many people who aren’t scientists a good feel for what the heck is going on. Many people were first introduced to the idea of carbon budgets through Bill McKibben’s popular article in Rolling Stone: Global Warming’s Terrifying New Math. McKibben looked at carbon budgets in the context of the fossil fuel producers. He pointed out that the world’s fossil fuel companies currently own and control several times more carbon than is required to destabilize the climate. This means that success on climate necessarily also means financial failure for much of the fossil fuel industry, as the value of their businesses is largely vested in the control of carbon intensive resources. If you’re familiar with McKibben’s Rolling Stone piece, you may have noticed that the current IPCC budget of 1000Gt is substantially larger than the 565Gt one McKibben cites. In part, that’s because these two budgets have different probabilities of success. 565Gt in 2012 gave an 80% chance of keeping warming to less than 2°C, while the 2014 IPCC budget of 1000Gt would be expected to yield less than 2°C warming only 66% of the time. The IPCC doesn’t even report a budget for an 80% chance. The longer we have delayed action on climate, the more flexible we have become with our notion of success. Like McKibben’s article, this projection is from about 3 years ago. In those 3 years, humanity released about 100Gt of CO2. So, using the same assumptions that went into the 565Gt budget, we would now have only about 465Gt left — enough to take us out to roughly 2030 at the current burn rate. There are various other tweaks that can be made with the budgets in addition to the desired probability of success, outlined here by the Carbon Tracker Initiative. These details are important, but they don’t change the big picture: continuing the last few decades trend in emissions growth will fully commit us to more than 2°C of warming by the 2030s. 2030 might sound like The Future, but it’s not so far away. It’s about as far in the future as 9/11 is in the past. It’s encouraging to hear that global CO2 emissions remained the same in 2014 as they were in 2013, despite the fact that the global economy kept growing, but even if that does end up being due to some kind of structural decoupling between emissions, energy, and our economy (rather than, say, China having a bad economic year), keeping emissions constant as we go forward is still far from a path to success. Holding emissions constant only stretches our fixed 1000Gt budget into the 2040s, rather than the 2030s. If we’d started reducing global emissions at 3.5% per year in 2011… we would have had a 50/50 chance of staying below 2°C by the end of the 21st century. If we wait until 2020 to peak global emissions, then the same 50/50 chance of success requires a 6% annual rate of decline. That’s something we’ve not yet seen in any developed economy, short of a major economic dislocation, like the collapse of the Soviet Union. And unlike that collapse, which was a fairly transient event, we will need these reductions to continue year after year for decades. We live in a special time for the 2°C target. We are in a transition period, that started in about 2010 and barring drastic change, will end around 2030. In 2010, the 2°C target was clearly physically possible, but the continuation of our current behavior and recent trends will render it physically unattainable within 15 years. Barring drastic change, over the course of these 20 or so years, our probability of success will steadily decline, and the speed of change required to succeed will steadily increase. I’m not saying “We have until 2030 to fix the problem.” What I’m saying is closer to “We need to be done fixing the problem by 2030.” The choice of the 2°C goal is political, but the physics of attaining it is not. My next post looks at carbon budgets at a much smaller scale — the city or the individual — since global numbers are too big and overwhelming for most of us to grasp in a personal, visceral way. How much carbon do you get to release over your lifetime if we’re to stay with in the 1000Gt budget? How much do you release today? What does it go toward? Flying? Driving? Electricity? Food? How much do these things vary across different cities? Featured image courtesy of user quakquak via Flickr, used under a Creative Commons Attribution License. The Union of Concerned Scientists has gone through the catalog of America’s coal plants, and found hundreds of mostly small, old, polluting, inefficient generating units that just aren’t worth operating any more, even on a purely economic basis. They looked at several different sets of assumptions, including different natural gas prices going forward, a price on carbon, whether or not the competing natural gas fired generation would need to built new, or whether it existed already with its capital costs paid off, and whether or not the production tax credit for wind ends up being renewed. In all of the scenarios considered, they found substantial coal fired generation that should be shut down on purely economic grounds, above and beyond the 288 generating units that are already slated for retirement in the next few years. 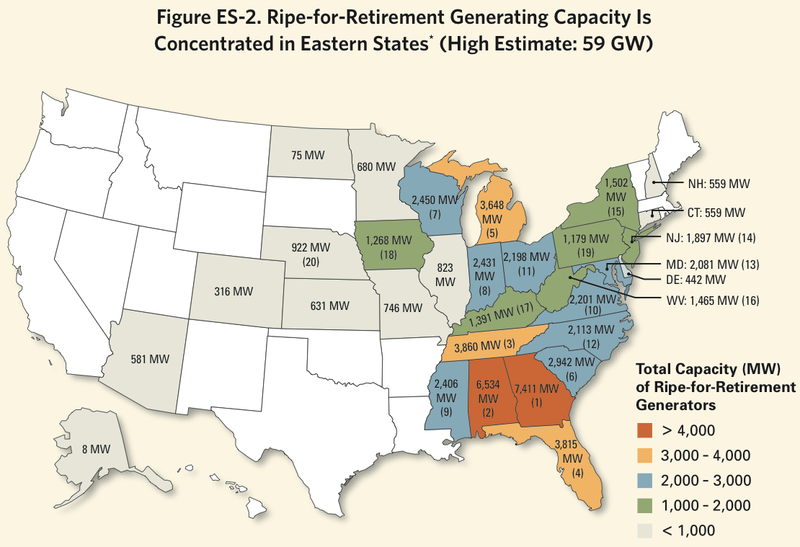 They also found that some companies — especially those in traditionally regulated monopoly utility markets in the Southeast — are particularly reluctant to retire uneconomic plants, perhaps because they can effectively pass on their costs to ratepayers, who remain none the wiser. When people compare the cost of gas-fired electricity and renewables, they usually don’t price fuel cost risks, and at this point that’s really just not intellectually honest. Risk-adjusted price comparisons are very difficult because nobody will sell a 30 year fixed price gas supply contract, and that’s what you’d need to buy to actually know how much your gas-fired electricity will cost. Even a 10 year futures contract doubles or triples the cost of gas. You can’t buy renewables without their intrinsic fuel-price hedge, and that hedge is valuable. The question shouldn’t be “Is wind the absolute cheapest option right now?” it should be “Given that wind will cost $60/MWh, are we willing to live with that energy cost in order not to have to worry about future price fluctuations?” And I think the answer should clearly be yes, even before you start pricing carbon. Last night I went to a presentation by the Renewables Yes technical and financial modeling team. They’ve put up a bunch of information about their modeling efforts on the web site. I’ve organized nine short videos of a previous iteration of the presentation into a single 90 minute playlist here if you want to see it yourself. It’s definitely worth watching if you use electricity in Boulder! This post is my attempt to digest and rephrase their conclusions.